I found this recipe and even though it was a hot summer day, tried it. I love, love it! The leftovers are even good. Definitely a keeper! Makes a large pot full. My family of 5 ate it and had enough for 2 more meals. Combine cinnamon, cumin, ginger, cloves, nutmeg, turmeric, curry powder, and salt in a large bowl, reserve. Melt butter in a large pot over medium heat. Cook the onion in the butter until soft and just beginning to brown, 5 to 10 minutes. Stir in the shredded kale and reserved spice mixture. Cook for 2 minutes or until kale begins to wilt and spices are fragrant. Pour the vegetable broth into the pot. Stir in the tomatoes, honey, carrots, sweet potatoes, potatoes, garbanzo beans, dried apricots, and lentils. Bring to boil; reduce heat to low. Simmer stew for 30 minutes or until the vegetables and lentils are cooked and tender. Season with black pepper to taste. If desired, combine optional cornstarch and water; stir into stew. Simmer until stew has thickened, about 5 minutes. I grew up eating hot breakfasts every single morning except Saturday when we had the priviledge of eating cold cereal (which we called mush). Even then it usually had very little sugar in it. My mom would take us shopping and we could pick out whatever kind we wanted as long as it had 3 or less grams of sugar. Do you know how hard it is to find cereal with 3 or less grams? Almost impossible!!! I know she must have given in occaisionally because our cereal cupboard was always stocked but also full of bugs because it didn’t get eaten fast enough. Fast forward… now we have been a cereal free house for almost 7 months. Which is so opposite last summer when I was caught up in coupon mania and our garage had 40 plus boxes of cereal I’d bought under a $1! My kids were in heaven eating it while I slept in. But then I’d wake up to 1/2 full bowls of wasted milk and cereal spilled! It made me so mad and 1 hour later everyone is cranky cause they are hungry. Cereal is not nourishing nor is it good. There are no cereals from the store , even organic that are good for you. No such thing as whole grain cause it’s all mushed up and extruded from machines before it’s plopped into a box. So we avoid it. But today my sweet, cereal-addicted husband who has so willingly given up the boxes, asked for cereal since I am not waking up to make him breakfast in the summer. So I am looking for recipes and things I can make that he can grab and go as fast as a bowl of cereal in the morning. Below is what I found from Nourished Kitchen. I want to try the soaked oatmeal this week and definately the oatcakes! They can store in the fridge and that would be fast thrown in the toaster oven. I will leave comments if I change something. I also want to try Baked Oatmeal. One thing I love for breakfast is sauteed veggies. 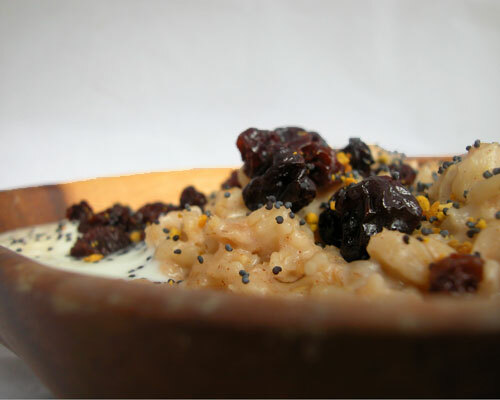 Pour the steel cut oats and nuts into a ceramic container or mixing bowl. Add enough filtered water to completely submerge your oats and nuts. Add a dash of salt and a two tablespoons of fresh yogurt, whey, kefir or buttermilk. Allow the oats and nuts to soak, covered, overnight in a warm place in your kitchen – about eight to twelve hours. After the mixture of oats and nuts has soaked overnight, dump them into a colander to drain and place the mixture back into the ceramic container or mixing bowl. Preheat the oven to 375 degrees Fahrenheit and grease a 13 x 9-inch rectangular baking pan with coconut oil or another wholesome fat of your choosing. Meanwhile beat together eggs, milk, maple syrup (if you’re using it), until well-combined and frothy. Pour the mixture of eggs, milk and maple syrup over the soaked oats and nuts, stirring well to combine into a porridge-like mixture. Gently fold dried fruit, cinnamon and coconut oil into the porridge-like mixture. Pour the mixture into a greased baking pan and smooth it out with a rubber spatula to ensure even baking and a good appearance. Bake in an oven preheated to 375 degrees Fahrenheit for forty to forty-five minutes or until the oatmeal achieves a pleasing golden-brown color on top, a knife inserted into its center comes out clean and free from liquid and the fragrance of baked oats, dried fruit and cinnamon perfumes your kitchen. If you can bear the wait, allow the baked oatmeal to cool for five to ten minutes before cutting into squares and serving.